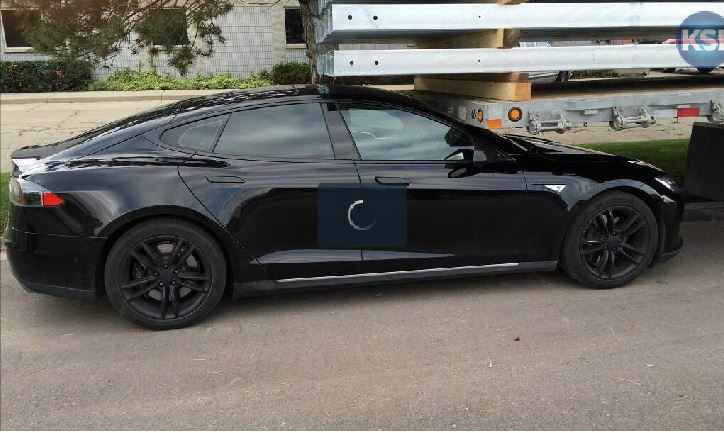 A Tesla Model S drove itself into the back of a large truck, breaking the windshield. The company says the owner initiated the Summon function. The owner denies he did any such thing. Tesla has come out to refute Jared Overton’s claim his Model S went rogue at the end of April and crashed into the back of a large truck while he was inside a store. Overton says he has a witness, a worker at the store he was parked in front, but Tesla remains unconvinced. The company sent Overton a detailed analysis of what the car’s data suggests. The Summon feature “was initiated by a double-press of the gear selector stalk button, shifting from Drive to Park and requesting Summon activation,” according to Tesla. Three seconds after the driver’s door closed, the Summon function was initiated. Overton says he put the vehicle in park. He has no recollection of initiating the Summon feature. He says the witness and he were talking about the car for 30 seconds to a full minute before they both went into the store. When he came out a few minutes later, his Tesla had impaled itself on the back end of a the truck parked in front of it. Even if he accidentally initiated the Summon feature, the vehicle should have started to park itself while he was still standing next to it, showing it off to the worker, he says. “They’re just assuming that I sat there and watched it happen, and I was OK with that,” Overton said. Each Tesla owner must agree to terms displayed on their touchscreen before the feature is enabled. “This feature will park Model S while the driver is outside the vehicle,” the statement continued. “Please note that the vehicle may not detect certain obstacles, including those that are very narrow (e.g., bikes), lower than the fascia, or hanging from the ceiling. Overton’s situation highlights a potential problem for all drivers of digitally connected cars. Owners are not permitted to access data collected from their vehicles citing it as property of the manufacturer. That makes it exceedingly difficult to ever dispute what the company says it finds. In this case, the Tesla did not fail to detect a small object. It somehow managed to ignore the back end of a rather large truck. That fact alone should motivate Tesla to take a closer look at what happened to Overton’s Tesla.